That short-haired little guy in the pet store is a Syrian hamster, known as a golden hamster if that's his color or a short-haired hamster if he's another shade. Long-haired Syrian hamsters, meanwhile, are called teddy bears. Bring yours home and take good care of him and you should enjoy his company for a couple of years. Your little pet's ancestors hail from Syria, where they are close to extinction in the wild. When full-grown, the short-haired hamster is between 5.5 and 6 inches long, with females larger than males. The average lifespan is about two years, although some might make it to age three. Short- and long-haired Syrian hamsters have the same average life span. The right kind of food, housing and necessary veterinary care can help your short-haired friend reach his maximum life expectancy. One way to shorten your hamster's life is to house him with another hamster. You'll end up with a rodent war, possibly to the death if you don't separate them. Short-haired hamsters must live alone. If you're buying them as pets for your kids, you need to purchase separate hamster housing and equipment for each one. There's a plus side -- if your children have separate bedrooms, there's no fighting over who gets to keep the pet's cage in their room. They can each have the pleasure. In addition to feeding your pet a good quality commercial hamster food, you must make have fresh, clean water always available. Use water bottles rather than bowls to prevent contamination. You can give any hamster fruits and vegetables as treats, in small amounts -- think one teaspoon every day or two. He'll happily chew on carrots, apples and lettuce. Since his teeth grow all the time, he needs fiber to wear them down. Provide him with timothy hay or small pesticide-free sticks so he can gnaw. Line his cage with shredded newspaper, hay or wood shavings that don't contain cedar or pine, which can harm hamsters. Clean out waste products daily, changing the bedding every few days. 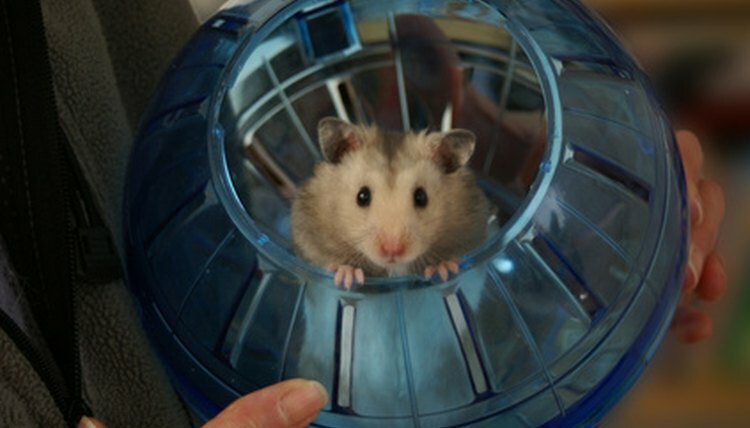 Give your pet toilet paper or paper towel tubes to tunnel with, along with a hamster wheel for exercise. Watch your hamster carefully for signs of illness. That means looking at his waste daily to note any color change in his poop or pee. A hunched appearance or refusal to eat is a red alert that something's wrong. Common illnesses include wet tail, a bacterial infection causing diarrhea. While a hamster can survive wet tail with veterinary treatment, Tyzzer's disease, which also causes diarrhea, is generally fatal. Take your pet to the vet if he experiences any loose feces. As your hamster ages, he might develop certain types of cancer, especially lymphoma. Symptoms include weight, appetite and hair loss. Older male hamsters often develop skin cancer, or melanoma. While both genders are subject to kidney and liver failure as get older, females get sick at a younger age and in higher numbers than their male counterparts. Older hamsters also succumb to heart disease and stroke. How Long Do Pet Ferrets Live?